Henry Cavill News: Weekend Sighting: Henry Headed To Chicago, Beard Gone! Weekend Sighting: Henry Headed To Chicago, Beard Gone! 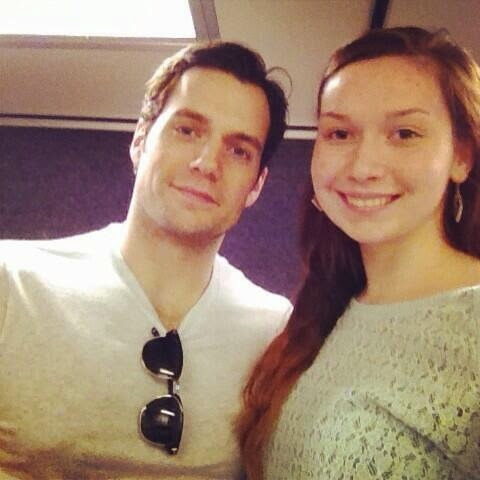 Sara (@sarabalara123) met Henry on her way to Chicago today. Is it a filming related trip for him? well the beard is gone! - Thanks for sharing Sara. Chicago/Yorkville fans, let us know if you spot any Batman vs. Superman filming at henrycavillnews@gmail.com. What airport were they in? They were on a train from Detroit. He was with Gina. It may just be a weekend getaway trip. Gina's birthday was April 16--maybe it was a birthday celebration/weekend getaway trip! I love this new pic. He looks so handsome...with or without the Beard. I sorta knew he was gonna show up on some fan photo; is it just me or I'm seeing a pattern here? He seems to allow fans to take pictures every holiday. Anyway thanks a bunch Henry!!! We love you for being so thoughtful about us fans.....We love you! I've always loved how accommodating he is to fans. Hopefully that will never change...as long as the fans are respectful.